The world that the author built for this story was a good one. I could picture it actually being a reality. Yet I do agree with another reader that while the world is good and even the characters are alright. Nothing too special about them other than maybe Nimmo. To be honest, this is a quick read but I was not in love with the characters and again I can't remember too much about them. Anyways back to what I was starting to say. I agree with another reader that there was a lot of talking and some poor choices that the characters maybe but not a lot of action. I was expecting more action from the sounds of the back cover. On the plus side I did like that the author did not use a lot of big words and even kept the murder clean with not a lot of details. Especially since this book is geared towards the younger audience. This is a nice little dystopian novel about a future where everything is under government surveillance. There are few ways to avoid this, one of which is becoming a rat runner. Another is to be involved in organized crime. Here these two 'cultures' meet with the expected explosive ending. The novel is nicely written and I enjoyed the creative way of adding humor to crime. It could use a sequel to let the readers know what happened to the main characters.It was a bit wordy, though, with too much time spent on dialogue instead of action. But my overall impression was quite favorable. Oooh, this book was fun. Every once in awhile I come across a book that has that magic formula that makes it so interesting, and this was definitely one of them! Rat Runners is set in a world not so different or far off from our own, where everyone is under observation, Safe Guards roam the streets keeping an eye on people, and anyone can find themselves being monitored at any time. Beneath it all is the seedy underground that flourishes with the children that are exempt from the tracking that adults get - children that know too much and have seen too much, whose intelligence would probably put many adults to shame! Right from the start we're plunged into this intriguing, dark world that's so familiar and yet so seamy at the same time. It's fascinating, and the story is woven in an intriguing way, moving from character to character to build the plot and also let us get to know each person a little more. It's the sort of tactic that's captivating when it's done well, and McGann definitely manages in this book. I actually wish that we'd had a bit more, but what we do see was enough to make me smile, and worry about the characters, and actually care about the build-up of tension as the book progressed. The world is fascinating as well. I summarised it a bit up above, but it's truly interesting. I love it when authors build worls that are so similar to our own, and yet different enough to be disturbing - and there's plenty of that in this book. I also enjoy it when a book manages to be compelling enough that I can imagine the events in the book actually happening, and that happened with this book. Who knows, a few years into the future and we might be dealing with this sort of thing!This book also has an intriguing combination of technology and action that made me want to keep turning the page, and a mystery that unfolds as well... It's rare that it's written so well, too, with no overdone cheesiness to make me want to roll my eyes, or to throw me out of the story. It's the sort of book that I could easily turned into a sci-fi/action movie, to be honest. All in all, the first enjoyable action book that I've laid my hands on in 2015, and definitely something I'd recommend! Disclosure: I received a copy of this book through Netgalley in return for an honest review. Review first published on blog http://mrripleysenchantedbooks.blogsp...After reading and enjoying other Oisin McGann books previously, I always knew that he was capable of writing such an epic adventure in his career. This new book, to me, has really delivered an all time great fantasy that even Eoin Colfer would be proud of writing. In fact four of the main characters each have Artemis traits about them that you will probably recognise - they certainly work well within the plot. Each has been brought together based on different personalities, goals and ways of working that impact on the adventure. Nimmo, Scope, Mankin and FX are all criminal-minded. They work in the blindspots of the city's shady underworld. However, they are soon caught up in a Hi-tech maze of deception, treachery and murder. If they were cats then their nine lives would be an advantage, but being Rat Runners they only have the one. Therefore the question is . . . will they need it? They have one simple task to complete which is to steal a mysterious box from a daughter of a dead scientist. This may sound simple, but first they have to invade the army of the "WatchWorld". These are masked, uniformed figures who run the city. They watch you and listen to you from every street corner using their well-equipped cameras, X-ray scanners, microphones and other hi-tech gadgets that we can only dream about. These terrifying SafeGuards can see through walls, hear your heartbeat, even analyse the smell of your sweat and that's just for starters. The main course involves the very controlling and evil BOSS guy, Move-Easy, who lives his life of crime hidden underground. With his army of controlled thugs, he deploys them to cause havoc. Then there's pudding - two rival gangs who all want a slice of the cherry pie. This brings an added dimension and a complex driven plot that will have you hooked to the last page. It is certainly a fast-paced, action-packed ride which is full of adrenaline. The imaginative ideas are, at times, slightly over complicated but they are used to good effect and definitely keep you on your paws! The attention to detail is phenomenal - everything has been thoroughly researched from the gadgets, the computer hacking, the undercover surveillance and genetics. All make the reading both fascinating and inspiring. Nevertheless, he has been able to balance this technological combination to create an amazing interactive thriller which is a winner. This is the best fantasy based book that I have read this year; I loved reading every single page. What can we expect next from Oisin? More of my reviews can be found on my blog, Booktastic Reviews! :)Whenever I read about books with a seemingly promising action-filled plot, the child in me who grew up loving the Alex Rider novels lets out a little squeal. However, though I'm not denying there was a good majority of action in this book, I just didn't really feel much of anything toward it whilst reading. Not toward the characters or, well, anything at all. Nevertheless, I didn't hate this book. It was just a rather so-so read.I think I'll just continue with the things I didn't really enjoy about the book first. Apart from not really connecting to the characters or seeing the sense in some of the decisions they made, probably the most major flaw that got to me was that I felt like the plot line had no direction. At times I was just like: There's no need for all of this! *pulls frustrated face* I also found it a little hard to follow a few of the action scenes every now and then. Nevertheless, there were some slightly redeeming qualities. For instance, the dystopian setting. Albeit a little confusing at times, the idea of WatchWorld was intriguing and different. And slightly terrifying - especially since you can totally picture something like that happening in the future! Also, expanding on my point about the characters, though I felt indifferent toward them, it's not like I disliked them in any way. The scene where Scope was tidying FX's 'Hide' had me laughing silly. Maybe if the characters relationships had been more developed then I might have liked them all more. Saying that, they were still all courageous, smart characters.To conclude, Rat Runners was a mediocre read for me. It wasn't tedious... but it wasn't exactly loveable either. The characters felt a little bland and the plot line frustrated me with the lack of direction it had. However, the world-building was admirable and unusual and a few of the main characters did have some redeeming qualities. I feel this book could be enjoyed more by tween readers who enjoy action novels, but I'd still say give it a go if it sounds like something you'd enjoy. I'll leave you now with my favourite quote:"'Someone's always watching,' Nimmo replied, as he dropped a rope down to them. 'But there's plenty they don't see.'" 4.5 starsThis book was a lot of fun. I breezed through it, and enjoyed the journey. The main 4 characters are young criminals, some out of necessity, others for ambiguous reasons. They each have their own talent or speciality. Nimmo (sounds like "nemo") is the strategist, Manikin is the actress, FX is the Techie, and Scope is the scientist. (All their names reflect their niche). They are tasked by a mob leader to collect a box from a scientist who has been murdered, supposedly containing credit cards. But delving deeper into the scientist's research pushes them into danger from every side. Their world is surrounded by cameras. In the aftermath of terrorism and supposed anarchy, the system "WatchWorld" was created in order to protect the citizens. Their motto is, "If you have nothing to hide, you have nothing to fear". But everyone has something to hide. I loved the characters and the story. The characters were diverse and clever (Scope is an Albino black girl, Manikin and FX have "coffee" skin and black hair, and Nimmo is never described beyond being "average". The story was fast paced and interesting. I think the only major weak point was the setting. The author obviously wanted a society without privacy and with totalitarian surveillance, and he succeeds, but I felt that the world could have been built and thought through a bit more thoroughly. The reasoning behind such drastic measured could be described, and the consequences, and public opinioncould have been voiced more. The main characters all being involved in the underworld would have a different view on the totalitarian security system than an ordinary person. However all in all, this was a fun read. I received a copy of this book from the publisher via Net Galley in exchange for an honest review. If you like high tech spy books, this might be just what you are looking for. In the future world, the only people who can escape the intense scrutiny of the government surveillance system are young teens. Mob bosses use these rat runners to carry out jobs through coercion and fear. When one group of runners discovers an invention that could change everything, they decide to use their street smarts and tech skills to keep it out of the hands of their boss, but the boss has more than just a few kids on his side, and he is willing to kill to get what he wants. While I initially struggled with this book, it became much more engaging once all of the players were introduced. The teens in this book were smart and resourceful, and, despite their association with illegal activities, they had a sense of right and justice. I think YA readers of both genders will enjoy this book. While the overall plot is not like Alex Rider, the Bourne books, or Mission Impossible, the secret and covert missions carried out are just as tense and the bad guys are just as threatening. Readers who enjoy books along that line and are willing to stick to the introductory chapters will be glad they did. The language and situations are appropriate for grades 7+. Rat Runners is an action-packed look at our dystopian future. London is covered by CCTV cameras that use facial recognition software to track everyone. SafeGuards are assigned to those suspected of criminal activity or randomly assigned to anyone over 18. They use superior tech to know if you are hiding anything. 16-and-unders are used by criminal gangs to do all of their dirty work, since they are the only ones exempt from surveillance. Nimmo, Manikin, FX and Scope have gotten in over their heads retrieving a package for gangster Move-Easy. It is supposed to be an easy retrieval of some credit cards from a dead guys flat, but it nearly gets them killed. A connected gang boss named Vapor wants those cards and more and he's more than willing to kill anyone that gets in the way. The dead guy was Nimmo's landlord and an inventor. His invention will change the world, but will it be for the better or will it be the end? Four young criminals. One simple task: to steal a mysterious box from the daughter of a dead scientist. They have to follow her, bug her phone, hack her computer, search her home, all without her knowing.But WatchWorld runs this city now...On every street are cameras, X-ray scanners, microphones. Terrifying Safe-Guards can see through walls, hear your heartbeat, analyze the smell of your sweat. Their motto? If you've nothing to hide, you've nothing to fear.But Nimmo, Scope, Manikin and FX, who work in the blind-spots of the city's shady underworld, are soon caught in a maze of deception, treachery and murder...Will they make it out of the rat-runs alive? At first, I thought for sure I was rating this book either 3 stars or 2. My final rating: 4.5But I am not rounding up for one key reason. It took nearly a fourth of the book for the story to actually start. Granted, once it did, the story was absolutely fantastic. 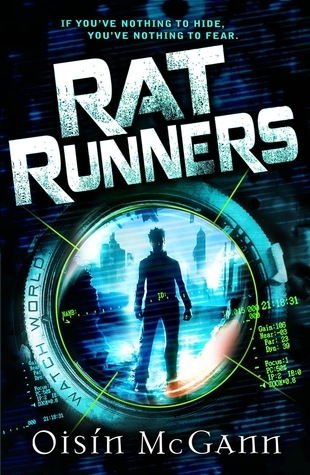 I didn't fall in love with the characters, but I did fall in love with the complexity of the rat runner world. The intelligence and plots of the main characters in this book were akin Artemis Fowl. Halfway through the book, I felt wrapped up in the action, mystery and suspense. This book is a great read, though I may recommend just skimming the first few chapters. It was alright. The concept was interesting, but the characters were kind bland and by the numbers. I've got to admit that i did quite like this book. It was full of mystery, deception and murder. It was a very good book (despite the name) It deserves to be four stars. Oisin McGann - Born in Dublin in 1973, Oisín spent his childhood there and in Drogheda, County Louth. He started writing and illustrating stories in copybooks when he was about six or seven, setting himself on a path that would steer him well clear of ever obtaining of a proper job.Despite his writing habit, he spent most of school convinced he was going to become a zoologist, an aspiration he lost after taking his first art exam in third year at St. Olivers Community College. Unable to conceive of a way to make a living from writing fiction after his Leaving Cert he decided to fund his dreams of being an author by working as an illustrator. He signed up for a design and print foundation course in Ballyfermot Senior College, Dublin, in 1990 and then studied animation at Dun Laoghaire School of Art and Design.In 1992 he dropped out of college to set himself up as a freelance illustrator/artist, serving the publishing and design industries. In 1997, he took up a position as Background Layout Designer for Fred Wolf films, working on the animated series of Zorro. After completing his contract, he decided to expand his horizons and left for London in February 1998 to seek his fortune. He found gainful employment as a security guard, watching over trains and then hospitals.In January 1999, he joined the M&M Consultancy, a small advertising and design firm, as art director and soon expanded into copy writing. After three and a half years of working in advertising he became increasingly concerned for his immortal soul. He returned to Ireland in the summer of 2002 much as he had left – with no job, no home and some meagre savings. He set himself up as a freelance illustrator once more, before getting his first books published in 2003.Oisin now works full-time as a writer and illustrator. He lives somewhere in the Irish countryside, where he won’t be heard shouting at his computer.